Kettering alternative rock trio Monarchs headline the Roadmender on Friday. 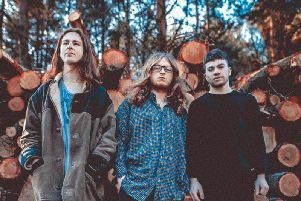 The band’s latest single Darker Shade of Black was released in October and follows Eyes, Lies which was released earlier this year and their debut EP Secrets which was released in 2016. Speaking about the single, the band said: “Darker Shade Of Black’ is the love child of Queens Of the Stone Age and Royal Blood. It’s about a mysterious woman who you can’t figure out, who keeps her cards close to her chest. It’s about playing cat and mouse with her and not knowing where you stand with her." The track was recorded, mixed and mastered by Jay Russell at Parlour recording studios in Kettering. Monarchs comprise singer and guitarist Sam Amos, bassist James Hayes and drummer Jamie Smith. They have previously supported the likes of Crows, Trampolene and The Amazons. Support at the Roadmender is by The Barratts and Hussy. Doors 7.30pm, tickets £4 in advance or £5. Tickets are also on sale for Dreadzone who return to headline the venue in December. The band, now in their third decade together, released their latest album Dread Times this year. One of the most exciting and powerful live bands to emerge from the post-rave scene, since their inception in 1993 Dreadzone have steadily been refining and perfecting their own take on dub. Doors open at 7.30pm, tickets cost £16.50 before fees. More details about all forthcoming gig at the venue are available online.